If you know me then you know when I cook the more cheese the better. 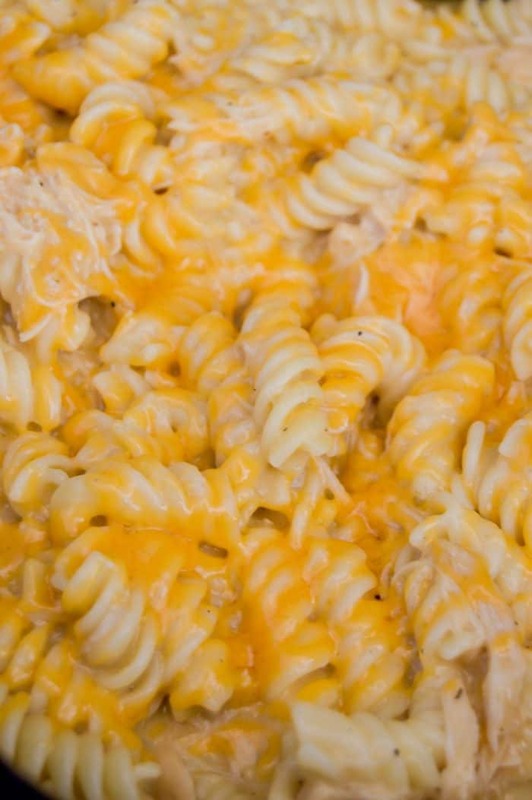 This Slow Cooker Cheesy Chicken Rotini is so creamy and so cheesy, you are going to love it. I usually don’t do a lot of pasta in the slow cooker since you have to cook it on the stove top. I am usually a dump and go slow cooker kinds gal. This recipe really changed my mind though. I started with my chicken and a creamy base. Let it all cook and then boiled some pasta about half an hour before dinner. Drained it then add it to the slow cooker with some cheese. It only needed to cook for about 20 more minutes then dinner was ready. Boiling the pasta on the stove top didn’t take that much work so I still felt like this was a simple slow cooker meal that I can put together quickly for my family. 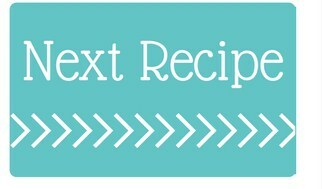 Incase you LOVE this recipe (I think you will) here are some more slow cooker chicken recipes to try next. Add chicken, cream of chicken soup (do not add water), chicken broth, pepper, oregano, garlic powder, and onion powder to your slow cooker. Cook then remove chicken once cooked, shred, and return to slow cooker. Meanwhile cook Rotini according to package directions and set aside. Add sour cream, 1 cup cheese, and cooked and drained pasta to your slow cooker. Top with reming cheese then cook for an additional 20 minutes on warm. 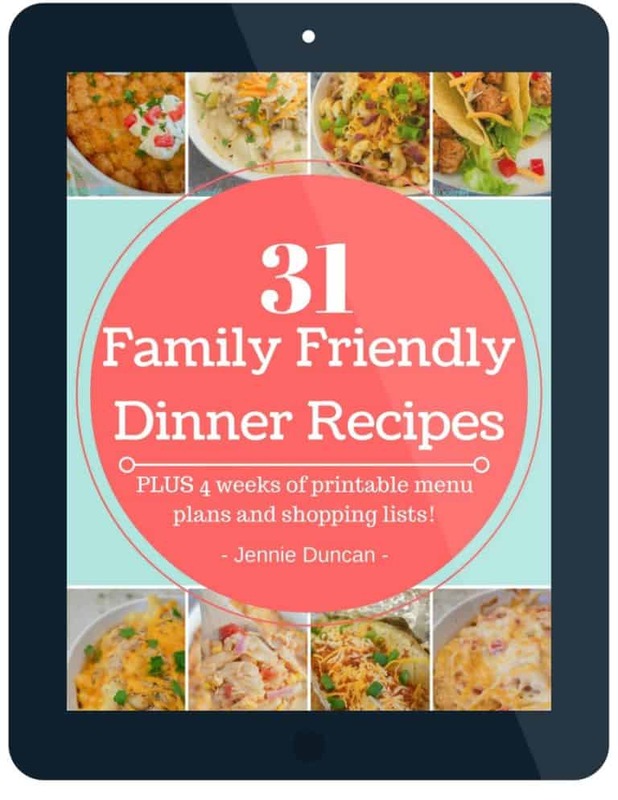 I served mine with salad and broccoli and my kids LOVED it! They even ate some leftovers the next day which usually doesn’t happen. Here are a few more side dish recipes ideas. 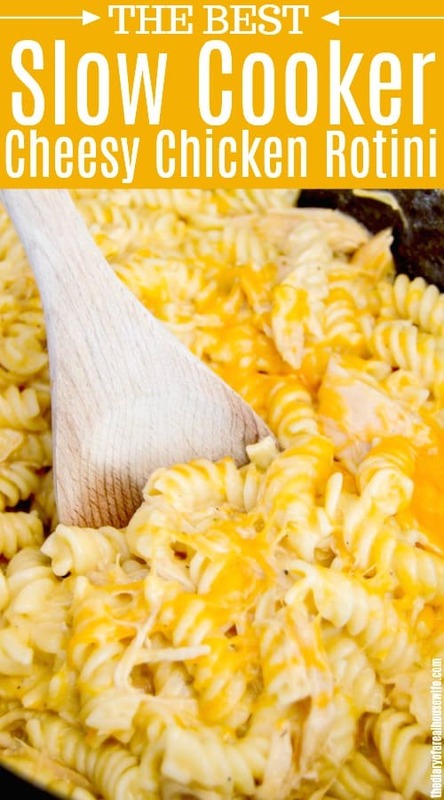 Here are more CHEESY recipes that I think you will LOVE! Baked Cheesy Ranch Potatoes: This is one of my favorite side dish recipes. Potatoes coved in ranch dressing and baked with cheese. Slow Cooker Cheesy Potato Casserole: This casserole is one we serve at every holiday! Growing up it was my favorite on Thanksgiving. Cheesy Ham and Potato Casserole: A classic casserole that the entire family will love. Add chicken, cream of chicken soup (do not add water), chicken broth, pepper, oregano, garlic powder, and onion powder to your slow cooker. Cook on low for 6-7 hours or on high for 4-5 hours. Remove chicken once cooked, shred, and return to slow cooker. 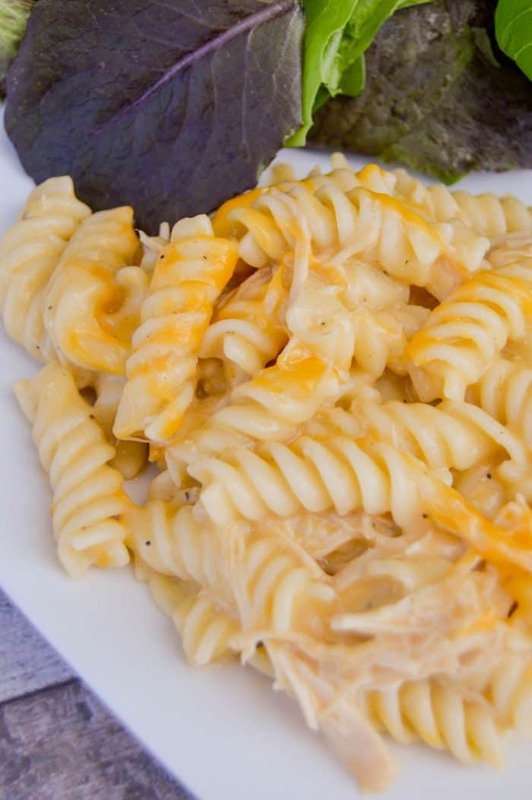 Add sour cream, 1 cup cheese, and cooked and drained pasta to your slow cooker. Top with reming cheese then cook for an additional 20 minutes on warm. No I think you could skip the sour cream. I have not tried it without myself though. The cream of chicken and chicken make a pretty good amount of sauce. You could always use a little less pasta to make sure it’s not dry. Hope you enjoy the recipe Veronica! Frozen chicken breast or not?? Hi Deidre! Frozen chicken can be used you just might need a little extra time for cooking. Can I use cooked chicken? Hi Sue, yes cooked chicken would work for this recipe. You would need to cook it just enough to heat everything since it will be cooked. Hope you enjoy it! Yah! So happy to hear that! 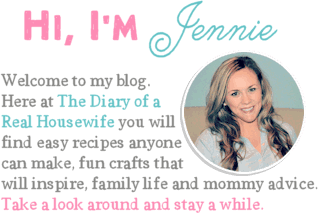 Have you ever made this in the crockpot express? I don’t know how long it would cook for. I have not tried that yet! I need to add it to my list!